Joseph Wright of Derby (1734–1797), A Philosopher Giving that Lecture on the Orrery, in which a Lamp is Put in Place of the Sun (1766), oil on canvas, 147.3 x 203.2 cm, Derby Museum and Art Gallery, Derby, England. Wikimedia Commons. Most of the narratives used by the paintings which I have shown so far are fairly conventional. Drawn from classical myth, epic poetry, fairy and folk tales, religion, plays, and most recently movies, they are obvious choices for depiction in paintings. 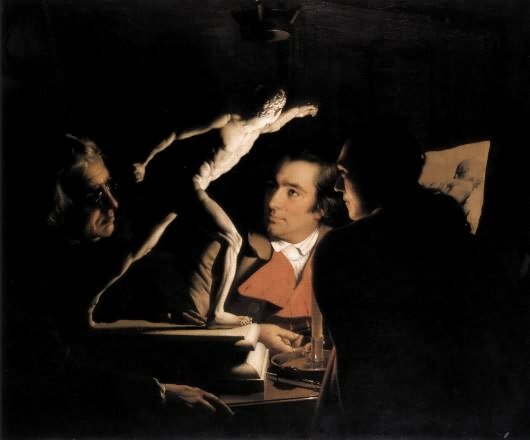 This article looks at paintings by one artist, Joseph Wright of Derby (1734–1797), who specialised in a very different form of narrative: that of the development of science and technology during the ‘enlightenment’ and early phase of the industrial revolution. He was not alone in painting such works – Philip de Loutherbourg, Turner, the Impressionists, and others showed contemporary technology too – but I think he is unique in producing so many paintings of them. Joseph Wright was also a successful portraitist, and a fine painter of landscapes. But from quite early in his career, he became captivated with the exciting changes which were happening during the 1700s in science, technology, and the arts. Joseph Wright of Derby (1734–1797), Three Persons Viewing the Gladiator by Candlelight (1765), oil on canvas, 101.6 x 121.9 cm, Private collection. Wikimedia Commons. Three Persons Viewing the Gladiator by Candlelight (1765) was Wright’s first exhibited painting, and shows three men studying a miniature replica of the Borghese gladiator sculpture as a canonical classical work of art. The two younger men are Wright himself on the right, and Peter Perez Burdett, a Derby man who was a cartographer and progressive spirit. At this time it was considered, even among the enlightened, that only men were able to undertake this sort of aesthetic exercise, and that women and children were simply incapable of doing so. It has also been proposed that Wright’s frequent use of such deep chiaroscuro was not just stylistic, but reflected the influence of John Locke’s metaphor of the mind as a darkened room into which the eye lets in images to be reflected upon and stored. 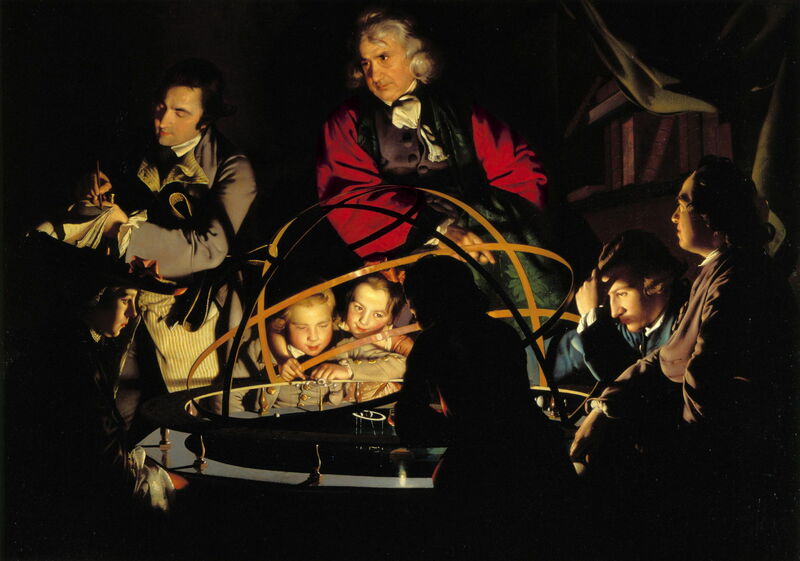 The following year, Wright exhibited one of his most enduring images of the period, A Philosopher Giving that Lecture on the Orrery, in which a Lamp is Put in Place of the Sun (1766). The orrery, a miniature planetarium showing the movements of the planets and their moons, was an impressive high-end Grand Orrery, an expensive device which would undoubtedly have captivated the minds of those able to gaze at it. There are numerous cues here to different narratives: to Locke’s educational theories with their emphasis on geography, understanding of astronomy, and Newton’s gravitation and mechanics. It has been proposed that the philosopher (in the red gown) is modelled on Newton’s likeness, and the figure at the left taking notes is the ever-present Peter Perez Burdett. Joseph Wright of Derby (1734–1797), An Experiment on a Bird in the Air Pump (1768), oil on canvas, 182.9 x 243.9 cm, The National Gallery, London. By courtesy of the National Gallery, Presented by Edward Tyrrell, 1863. 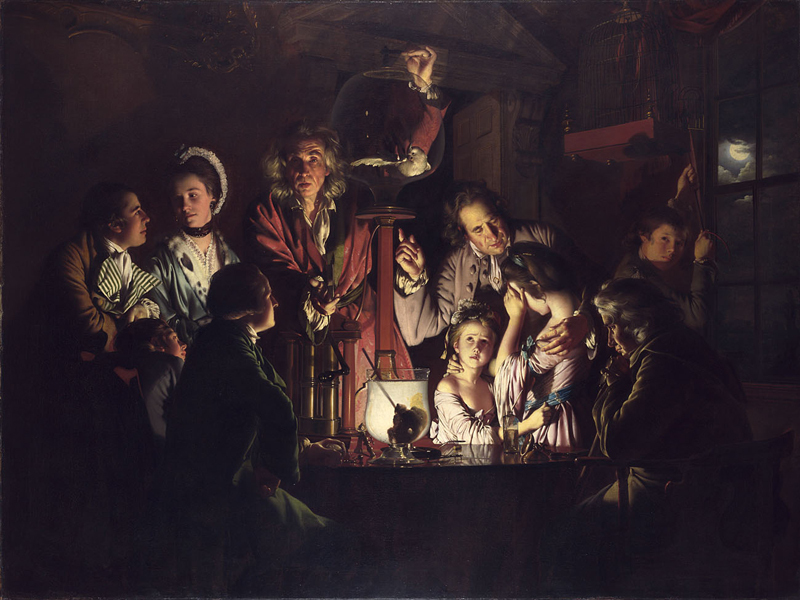 An Experiment on a Bird in the Air Pump (1768) is another famous work by Wright which epitomises the culture of the enlightenment. Here the philosopher (red gown again) is seen at the climax of his lecture on pneumatics, inspired by the radical chemist Joseph Priestley. A precious white cockatoo has been taken from its cage, at the left of the table, and placed inside the large glass jar at the top. A vacuum pump has then been used to evacuate the air from within the jar, and the cockatoo has collapsed near death. Wright shows the moment of peripeteia, as the philosopher is about to open the tap at the top of the jar and restore the air to the bird, hopefully resulting in its revivification, and transformation of the anguish and horror being expressed by the two girls at the table. Joseph Wright of Derby (1734–1797), Academy by Lamplight (1769), oil on canvas, 127 x 101 cm, Yale Center for British Art, New Haven, CT. Wikimedia Commons. Wright also developed the theme of improvements in access to art education, and encouragement of drawing and painting skills. Academy by Lamplight (1769) was the first of a pair of paintings devoted to this, and making pointed commentary about the newly-founded Royal Academy. Here students at different stages of their artistic development are gathered round a full-scale reproduction of the Hellenistic sculpture Nymph with a Shell (the original was and is in the Louvre, Paris). Wright clearly saw this more egalitarian scenario preferable to the establishment of the Royal Academy under its first president, Sir Joshua Reynolds. 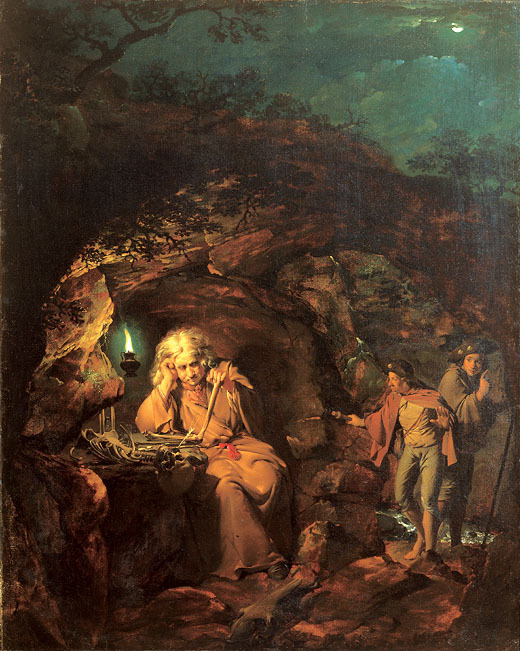 Joseph Wright of Derby (1734–1797), A Philosopher by Lamp Light (1769), oil on canvas, 128.2 x 102 cm, Derby Museum and Art Gallery, Derby, England. Wikimedia Commons. 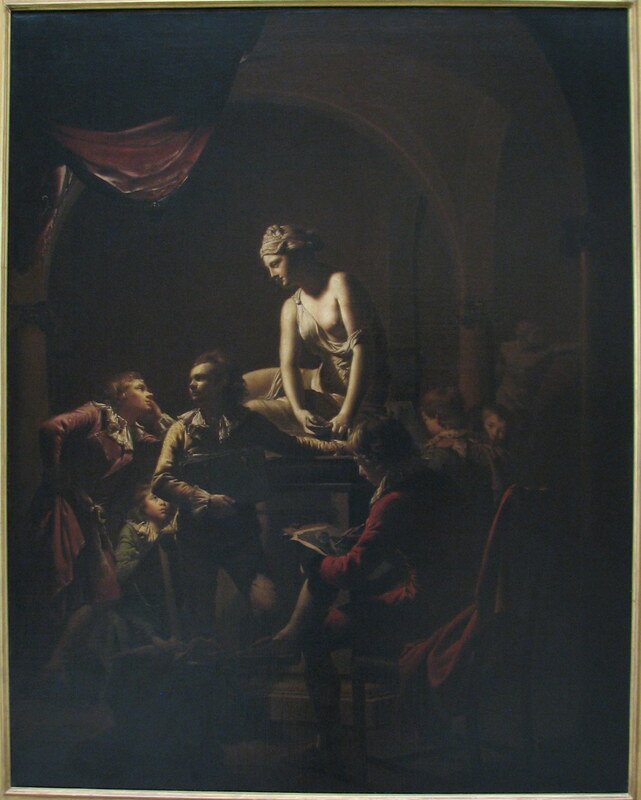 His A Philosopher by Lamp Light (1769) was still more pointed a reference to the Royal Academy, being a reworking of a Salvator Rosa style painting, perhaps warning the new members of the Academy of the transience of earthly glory. 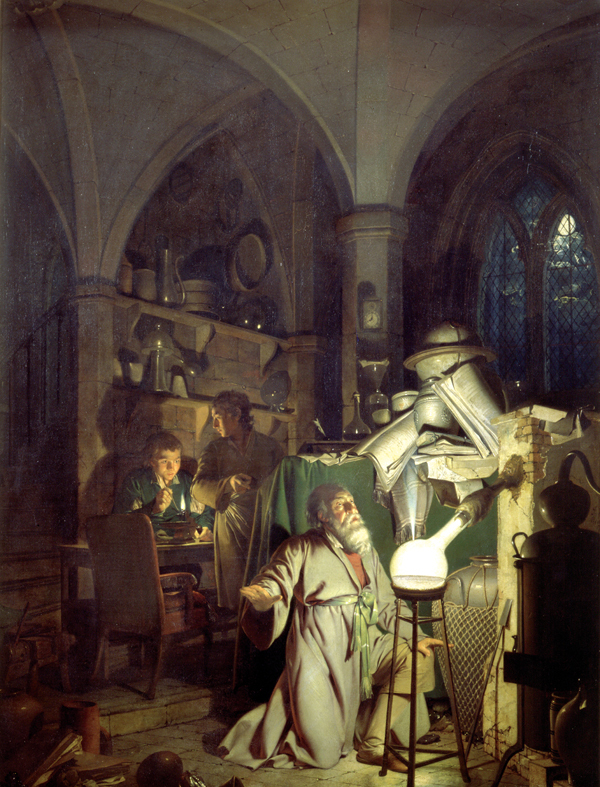 Joseph Wright of Derby (1734–1797), The Alchymist, in Search of the Philosopher’s Stone, Discovers Phosphorus, and Prays for the Successful Conclusion of his Operation, as was the Custom of the Ancient Chymical Astrologers (1771-95), oil on canvas, 127 x 101.6 cm, Derby Museum and Art Gallery, Derby, England. Wikimedia Commons. Today’s concept of alchemy as a mixture of magic and charlatanism was not established in Wright’s day. His The Alchymist, in Search of the Philosopher’s Stone, Discovers Phosphorus, and Prays for the Successful Conclusion of his Operation, as was the Custom of the Ancient Chymical Astrologers (1771-95) – which summarises its narrative in the title! – is far more sympathetic. Wright created this image from a variety of sources, including drawings provided by Peter Perez Burdett from his new chemical laboratory in Liverpool, and classical engravings. It is appropriate in depicting the purification of phosphorous, which was seen as a productive and positive outcome from the ancient pursuit of alchemy. Joseph Wright of Derby (1734–1797), An Iron Forge (1772), oil on canvas, 121.9 x 132.1 cm, The Tate Gallery, London. Wikimedia Commons. 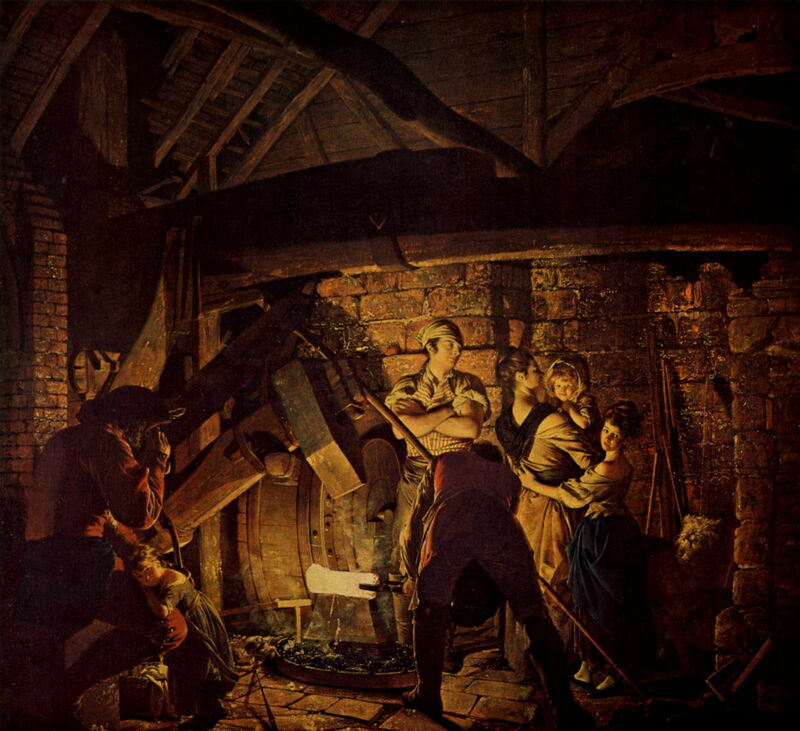 An Iron Forge (1772) is one of a series of paintings which were both commercially successful, and accurate portrayals of the small-scale technological advances of the day. It shows a group of workers forging a white-hot iron casting, using a tilt-hammer powered by a water-wheel. Also present is the wife and children of the iron-founder, stressing the family nature of these small forges at the time. Joseph Wright of Derby (1734–1797), Vesuvius from Portici (c 1774-6), oil on canvas, 101 x 127 cm, The Huntington Library, San Marino, CA. Wikimedia Commons. Wright travelled to Italy in 1773 to paint landscapes, going on to visit Naples late the following year. Although he undoubtedly saw some volcanic effects at the time, Vesuvius had last undergone a major eruption in 1767, so much of his Vesuvius from Portici (c 1774-6) must have been painted from his imagination and studies. This was done not so much from a desire for the spectacular, but from scientific curiosity. On his return to England in 1775, he painted at least thirty views of Vesuvius erupting. He exploited the Burkean sublime very well, and they were critically acclaimed. Joseph Wright of Derby (1734–1797), The Girandola, or Firework Display at Castel Sant’Angelo in Rome (1779), oil on canvas, 162.5 x 213 cm, The Hermitage, Saint Petersburg, Russia. Wikimedia Commons. 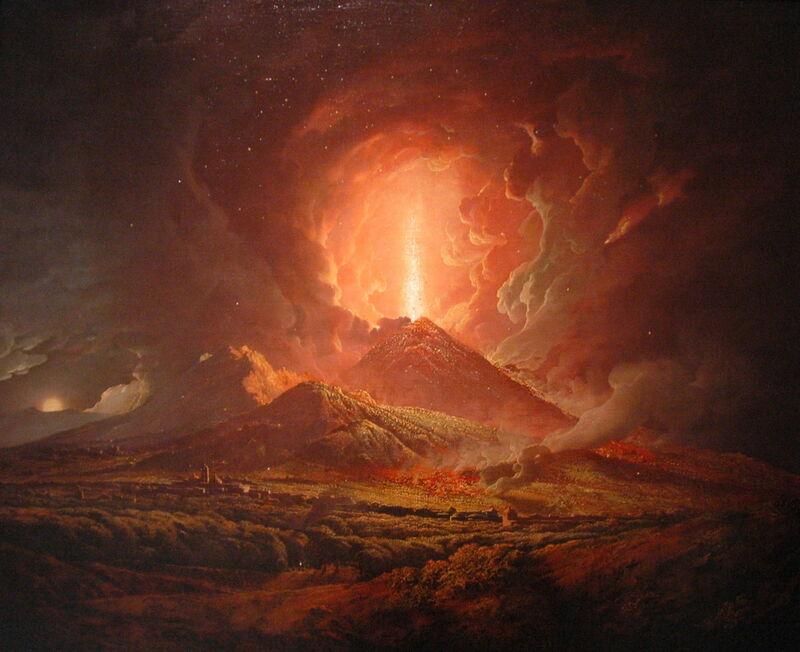 When in Rome, Wright took the opportunity to match the greatest effect of nature, in the volcano, with that of the art of man, in The Girandola, or Firework Display at Castel Sant’Angelo in Rome (1779). Firework displays took place several times a year, from the roof of the Castel Sant’Angelo, during Holy Week and on the eve of the festival of Saints Peter and Paul. This painting was purchased with a companion of Vesuvius by Catherine the Great, Empress of Russia. Later in his career, Wright painted more traditional narratives too. The first is based on the the classic story of Dibutades, the maid of Corinth, who ‘invented’ painting. The daughter of a potter, her boyfriend was due to leave the city. In order to remember him, she traced the outline of his shadow on a wall, when he was sleeping. Once he had gone, she was left with his silhouette, and her father then filled it with clay, which he fired in his kiln, making the first relief sculpture. The modell’d image, and the pencil’d face! Joseph Wright of Derby (1734–1797), The Corinthian Maid (c 1782-5), oil on canvas, 106.3 x 130.8 cm, The National Gallery of Art, Washington, DC. Wikimedia Commons. 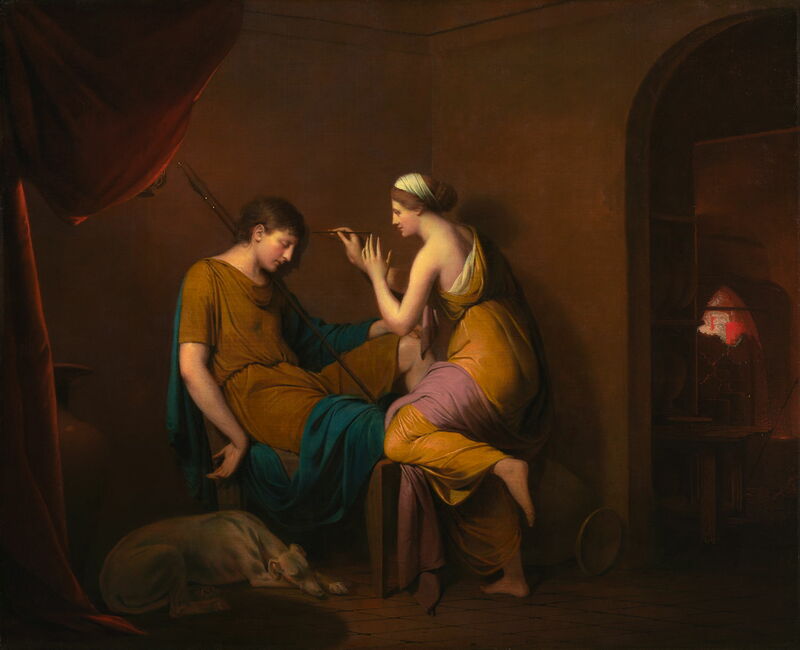 Wright’s The Corinthian Maid (c 1782-5) was painted for a commission by Josiah Wedgewood, affluent and successful founder of the local Wedgewood pottery. Its physical companion shared the theme of wifely fidelity, in showing the wife of Odysseus/Ulysses, Penelope. In the many years that her husband was away on the Odyssey, she told potential suitors that she could not remarry until she had completed weaving a shroud for Odysseus’ father. Although they saw her weaving intently by day, she then unravelled her work each night. Joseph Wright of Derby (1734–1797), Penelope Unravelling her Web by Lamp-light (1785), oil on canvas, 101.6 x 127 cm, The Getty Center, Los Angeles, CA. Wikimedia Commons. 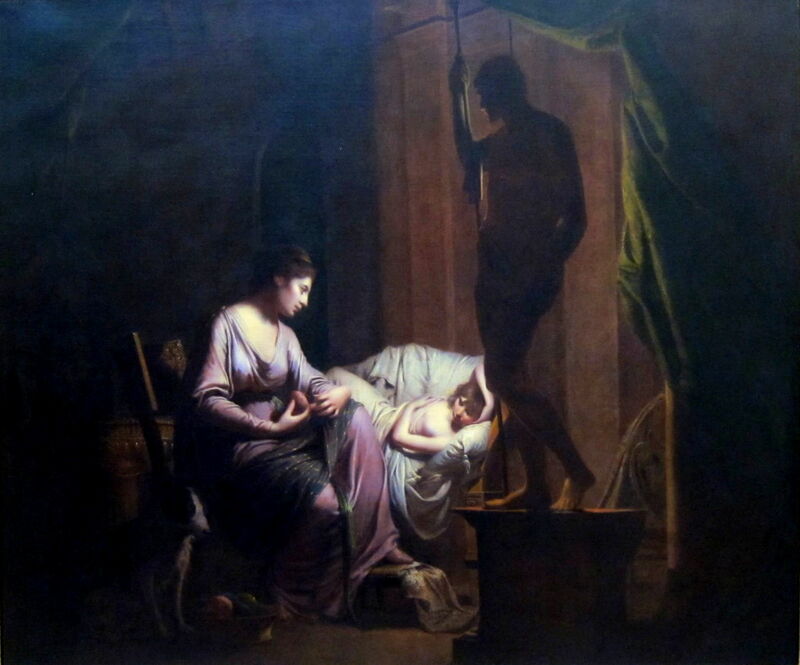 Penelope Unravelling her Web by Lamp-light (1785) shows Penelope watching over her sick child, while Odysseus’ statue watches her carefully unravelling her day’s work. Shakespeare’s tragedy Romeo and Juliet (published 1597) would have been familiar to the learned classes of the day. It reaches a climax when Juliet is discovered apparently dead, but in fact comatose from a potion which she took to avoid her arranged marriage. Her body is placed in the family crypt, but the messenger intended to inform Romeo of Juliet’s plan failed to reach Romeo. Instead, he learns of Juliet’s apparent death from his servant, buys poison, and goes to the crypt in which Juliet is laid out. Meeting her fiancé, the two men fight, and Romeo kills her fiancé before taking poison himself. When Juliet awakens from her coma, she sees Romeo dead, and stabs herself with his dagger. Joseph Wright of Derby (1734–1797), Romeo and Juliet. The Tomb Scene (1790), oil on canvas, 177.8 x 241.3 cm, Derby Museum and Art Gallery, Derby, England. Wikimedia Commons. In Romeo and Juliet. 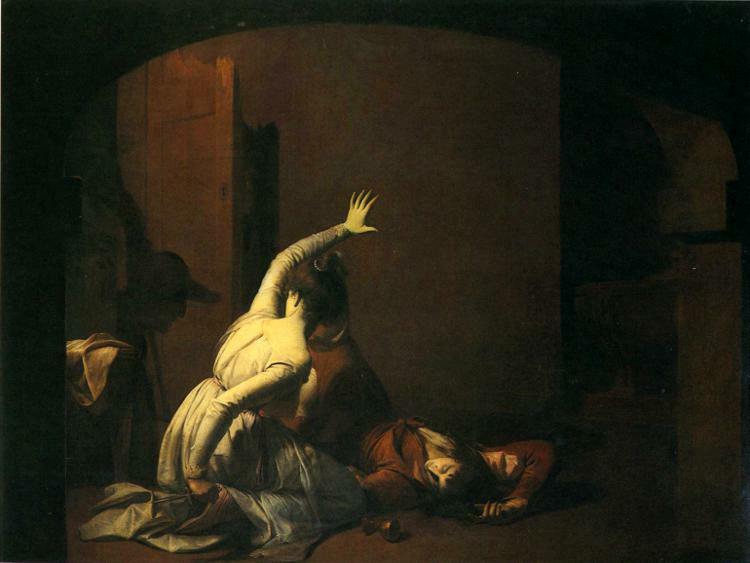 The Tomb Scene (1790), Wright shows Juliet, still white from her coma and dressed in funeral attire, when she has just discovered Romeo’s dead body, and before she commits suicide with his dagger: the theatrical climax. However the artist hides both their faces from view, leaving Juliet’s body language to tell us of her anguish, and the cue of the cup from which he drank poison. 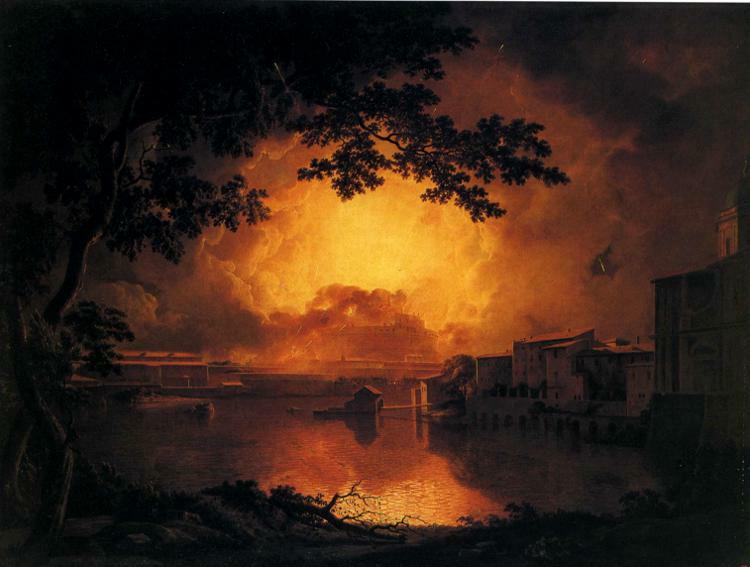 Joseph Wright has been largely forgotten, but his enlightenment narratives remain extremely innovative. He used traditional tools, with facial expression, body language, and extensive cues, to create coherent narratives which refer not just to their immediate scientific and cultural stories, but to the much bigger picture of changing ideas and values. The Joseph Wright Gallery, Derby. Daniels S (undated) Joseph Wright, British Artists, The Tate Gallery. ISBN 978 1 854 37284 0. Posted in General, Painting and tagged alchemy, Burke, Derby, Enlightenment, Locke, narrative, Newton, painting, Priestley, Reynolds, sciences, Vesuvius, Wright. Bookmark the permalink. How long would it take for Apple to break into your iPhone? Should you use a PIN or a password to secure your iPhone?